Kayongo launched a nonprofit organization to repurpose discarded soap for people in need. Hear his presentation at next month’s AAMC National Professional Development Conference for Institutional Advancement. 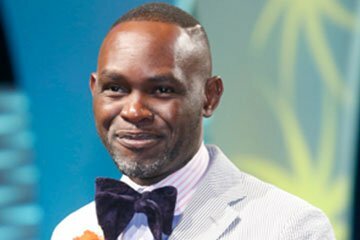 A simple bar of soap has carried Uganda-born Derreck Kayongo to renown as an expert on environmental sustainability and global health. Selected for CNN’s Top 10 Hero Award in 2011 and recently chosen by former President Jimmy Carter for the National Archives’ Amending America Initiative, among many other honors, he and his family fled from Uganda to Kenya in the 1970s during dictator Idi Amin’s reign of terror. Eventually he emigrated to the United States where he became a U.S. citizen. He received bachelor’s and master’s degrees and took a position as a field coordinator for CARE International, a private humanitarian aid organization. In 2009, Kayongo established the Global Soap Project, collecting discarded soap from hotels, turning it into new bars, and then redistributing the soap to impoverished populations around the world. In 2015, Global Soap joined forces with Clean the World, making it the largest global recycler of hotel soaps, distributed in nearly 90 countries. Although no longer directly involved in the organization, Kayongo continues as a spokesperson for improving health through access to soap and hygiene education. He is now CEO of Atlanta’s Center for Civil and Human Rights. You came of age during one of the darkest periods of Uganda’s history. How does that affect your life today? As a child coming home from school, I passed dead bodies of friends and neighbors. My father was kidnapped and feared dead but was returned safely. Shortly after that we moved to Kenya. While we never lived in the camps where people were worse off, we struggled. Soap was so hard to come by, sometimes completely nonexistent. People were getting sick and in some cases dying because they couldn't wash their hands. That’s something that never leaves you. After I came to the United States and was staying in a hotel, I noticed that the bathrooms had three kinds of soap—hand, body, and face—and [the staff] put new bars in every day. So when I asked the hotel manager about it, thinking they would charge me for the new soap, I was told that it was hotel policy to discard the old soaps and replace them with fresh ones. I called my father, a former soap maker himself, and neither of us could believe it. But that’s how I came up with the idea. Why not recycle the partially used bars and make brand new ones, then send them to places where people could not afford soap? So I started the Global Soap Project in my basement, making about 500 bars a week. How did you convince decision makers, and others who didn’t know you, to work with you to make Global Soap a reality? Along with not taking no for an answer, I showed them how they could benefit from recycling soap. That meant clearly communicating the story: 2.6 million bars of soap were being discarded every day, their chemicals harming the environment—when refugees could have access to life-saving personal hygiene. By explaining the situation from their point of view and showing how Global Soap could help solve the problem, I got their buy-in. How did you come up with S.E.L.F. principles (service, education, leadership, and faith) and how do they work? The last piece is faith, in yourself, not only as a person but also as an entrepreneur and leader. Personal growth can be a humbling experience, but it also nourishes faith. And if you can reflect enthusiasm, it will attract others. It can be easier said than done, but a willingness to learn and trust that your solutions will work helps, as does the ability to say “I don’t know” and then find out the answer. How do these principles apply to hospitals and medical schools? Along with trusting your own expertise as well as that of your colleagues, understand that you’ll be dealing with uncertainty and stay inquisitive. These are exciting times in medicine, despite attacks [on the health care system]. Critiques can be an opportunity [to grow] and to try new systems and methods. Health care has many simple solutions, such as hygiene through handwashing and basic prevention. Yet sometimes these are overlooked. Also, an organization is an intersection of not only the sciences but also marketing, accounting, leadership, human resources, and others. Don’t let them fall sick. Encourage a culture that allows everyone within the institution to feel respected, loved, and even given a chance to fail. Too often, money is the driving factor and we don’t think about the people within. When that happens, [staff] quit within a year or two for a better opportunity. So much more gets accomplished when you nurture and recognize the value of people; then they stick around for decades. How might institutions and nonprofits innovate to stay vital and relevant? Traditionally nonprofits made their money through donations. However, that may no longer be enough to sustain them, thus presenting an opportunity to be entrepreneurial. At Global Soap, we sell some soap commercially to offset the cost of donating soap. Other streams of income can be, for example, an online gift store that sells T-shirts, mugs, and the like. Looking into alternative forms of revenue can not only decrease dependency on donations but also make the organization more robust.